I had a few hours in a waiting room today which was the ideal opportunity to make some progress on with my Scarface embroidery. I had considered doing some appliqué which involves sewing on pieces of fabric but after playing around with some pieces of material decided that this would distract from the needlework. So I decided to continue embroidering. I liked the look of the 'Long and Short Stitch' in the '100 Embroidery Stitches' Emmylou showed us so I tried this for the sky and am fairly happy with how it is going. The photo is a bit dark so I will upload a better one soon. Today we worked on images for the screen printing we will do next week. 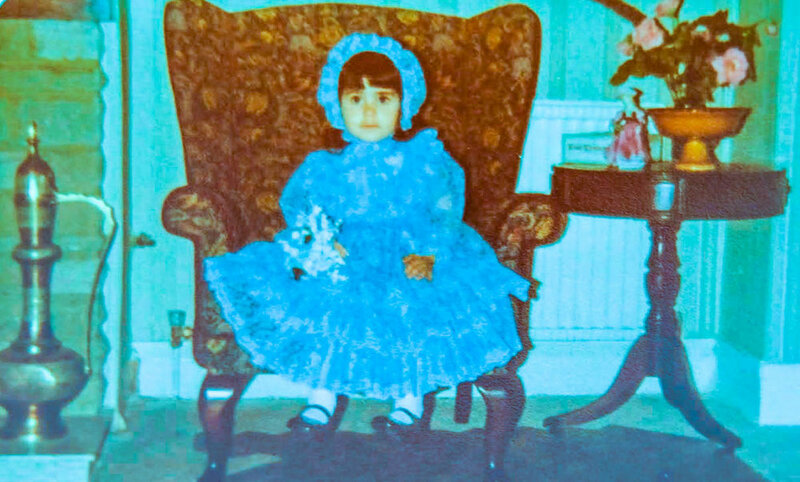 Initially I wanted to print an image of the three year old me in my bridesmaid dress but it became clear that the image was not suitable for this kind of printing due to the lack of contrast. I therefore created a new image using carbon and tracing paper and a photograph I took whilst living in Cyprus. The photograph is like many I took whilst walking in Cyprus. This one is of the road leading up out of the valley beside the village of Esentepe / Ayios Amvrosios. The building at the top is like many of the partially completed houses in the area. a girl or woman, usually one of several, who accompanies a bride on her wedding day. a person who never attains a desire or goal. I have been a bridesmaid several times. I have particularly vivid memories of being a bridesmaid at family weddings in Northampton, London and Cyprus. However I have no recollection of being a bridesmaid at the wedding of my Semra hala (hala = paternal aunt in Turkish). What I do have is this photograph. I feel like it is a work of art in itself and I don't need to do much to it. This photograph must have been taken in 1979 when I was three years old because that is the year that Semra hala got married. I don't know who took the photograph, most likely my mum or dad. Every item in the photograph is familiar yet strange, only the ornate, brass imbrik, a gift from a friend of my father, in the left corner remains in my parents' sitting room. Even the radiator in the background has been replaced. The small, pink figurine on the table to the right seems to intensify my childlike ladyness. I appear to have been carefully placed in position moments before the photograph was taken, perhaps after trying on the outfit for the first time. It seems as though the outfit is happening to me and yet I appear to entirely embody the role that has been chosen for me despite not yet being capable of understanding it. Why is this in the textiles section? I intend to print images of me in my various bridesmaid roles onto fabric, maybe a t-shirt or dress. I don't have photographs of me in all my bridesmaid dresses so I need to do some searching. If you have any bridesmaid photographs of me please let me know. Today I continued working on an embroidery of my Scarface character. Her character is changed and perhaps softened by this medium however her true nature will out! After two weeks on the 2D specialism I switched to Textiles. I've been drawing and painting for many years and I decided I wanted to try something new. EmmyLou taught us weaving in my first week with the group. The experience of sitting with a small group of women, chatting and using my hands to make something was soothing. My first and most likely only attempt at weaving resembles an unravelling muppet which is kind of how I feel at the moment.